One of the perks of the warmer summer months is being able to relax outdoors. Whether you want to sit by the pool and soak up some sun, or lounge in the shade with a good book you need a comfortable chair. While you can always run out and buy a cheap, hard plastic lounging chair, there are other options. We found a great outdoor reclining chair that is not only amazingly comfortable, it also won’t break your wallet. Here is what we found when we decided to review the Caravan Canopy Zero Gravity Chair. One of the first things you’ll notice about this chair is that it wider than many of its competitors. With a full 5.3” more in width, you’ll always have plenty of room to stretch out or curl up. The chair reclines and locks into place easily, and helps to reduce stress and tension on your lower back by comfortably raising your legs. With several different reclining positions to choose from, it is easy to get and stay comfortable. This zero gravity chair gives you the feeling of weightlessness when you are fully reclined, and the durable outdoor fabric and powder coated steel frame give you the sense of support and security you need to fully relax. For additional comfort, the chair also features an adjustable headrest. Along with being durable and long lasting, this reclining chair is also available in several fashionable colors. Match existing outdoor furniture, or start a new color scheme, these comfortable reclining chairs look great anywhere you put them. The chair easily folds up to only 5.5” thick and is lightweight enough to comfortably carry anywhere. Use it by the pool, at the beach, or simply enjoy a lazy afternoon in the shade. 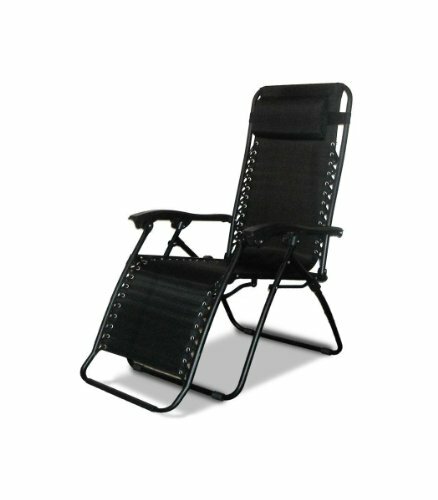 This durable outdoor reclining chair is 65.5” long and 33” high when it is completely unfolded. If you need to know the measurements for storage purposes, they are 5.5” height, and a width of 25.5” including the folded legs. The anti gravity chair can also comfortably support weights of up to 250 lbs. With several different colors to choose from you can find the perfect reclining chair to fit your outdoor area. The long lasting weather resistant construction and zero gravity effect make this one of the best lounge chairs for relaxing during the long summer days.